This article was written by Kathryn Dickinson, Online Marketing Executive at our head office, who has been racing triathlon for over 6 years. Having always ridden traditional, racing road bikes I was intrigued by a road bike with built in suspension. Last week I picked up the Specialized Ruby Elite that I was going to be riding to pit it against the questionable road surfaces of Rutland. I had reservations about the more upright position of the Ruby as I am used to a racing-style position, but I grabbed my kit and headed out to some cobbles (I couldn't not take a bike inspired by Paris-Roubaix onto some cobbles!). The Specialized Ruby is the female specific version of the Roubaix, both bikes are designed with the famous one day cycling classic in mind, the Paris-Roubaix. 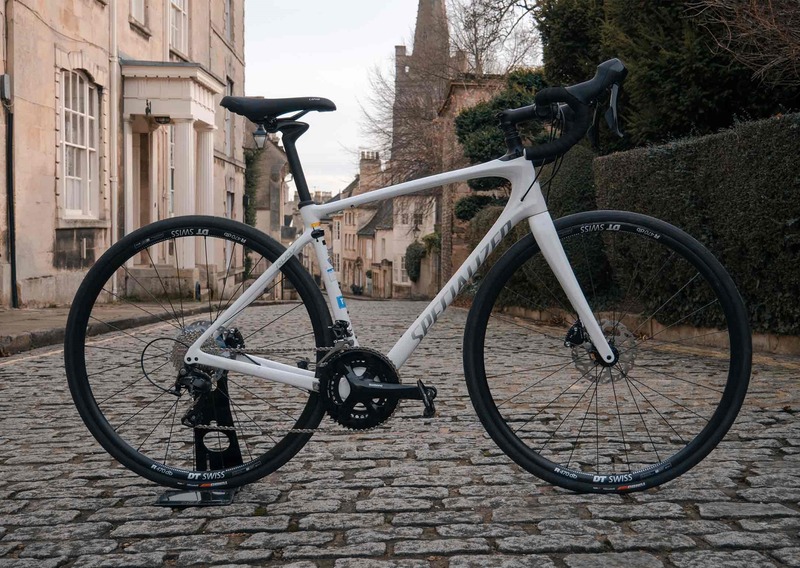 First launched in 2005, the Ruby range has seen major improvements over the past 13 years and with the 2019 bikes featuring the same frame as the 2018 range, it seems Specialized have really hit the nail on the head with this endurance bike design. So what makes this endurance bike different to a normal road bike? For starters, the "Future Shock" technology located in the headtube. "Future Shock" was developed by Specialized to act as a damper for any bumps and holes in the road, it is a spring-loaded suspension system that allows for 20mm of travel. There are three different spring options for different rider weights and styles of riding, these can easily be changed by a mechanic to suit your needs. To give a smoother ride there is the Cobl Gblr seatpost, the kinked section of the seatpost, which cushions the seatpost with a polymer block. Alongside this, the seatpost clamp is located underneath the join between the top tube and seat tube which allows for more flex and absorption of vibrations. The frame is made from FACT 10r carbon, Specialized's own carbon composite frame material, giving a lightweight, stiff feel yet absorbent to rougher road surfaces. The Ruby comes with Comp Hover handlebars giving a 15mm rise, add this to the higher stack on the handlebars, this means a much more upright position which is perfect for me on longer rides as I suffer with a sore neck on anything longer than two hours. This range comes with Specialized's Rider-First technology, what this means is that regardless of your size, each bike is designed to ride the same throughout the size range. The groupset is a mix of Shimano 105 with RS505 shifters and hydraulic disc brakes, giving you a sharp, responsive feel when braking. The Elite comes with an 11-32t cassette meaning this bike is fantastic for those longer rides and climbs. How did it feel riding? It took a few minutes to get used to the position of the bike but once this had passed I really started to notice the effect of the suspension. The Ruby glided over the little bumps and uneven parts of the road, you can still feel the larger holes but this is to be expected with the size of some of the potholes on my local roads! The upright position is comfortable without it feeling like a traditional ladies leisure bike, but when you want to ride faster this bike is ready to go. I had feared that the Future Shock would feel like riding a full sus MTB on the roads but climbing is great on this bike, even for a bike that isn't designed to fly up climbs. This is my first time riding with disc brakes and I have to say, I think I'm converted! I love the control you have with disc brakes, especially in the wet, and the confidence when descending that I know I can stop quickly. I have been using this bike to commute to work, a short 15 minute cycle featuring a few hills and some bumpy country roads, and the Ruby works great! I have put my SKS Mudguards, and Bontrager Ion Pro RT Front Light and Bontrager Flare R Rear Light on the bike and it has transformed into the perfect commuter bike. The Ruby absorbs all of the bumps in the road and climbs really well with a great choice of gearing. I would definitely recommend to anyone looking for a bike for those longer rides and for commuting to work. The Specialized Ruby Elite has been designed to provide you with a bike that is comfortable as well as having the ability to really put in the performances that you want it to. Come along to your local shop to view our range of women's bikes!